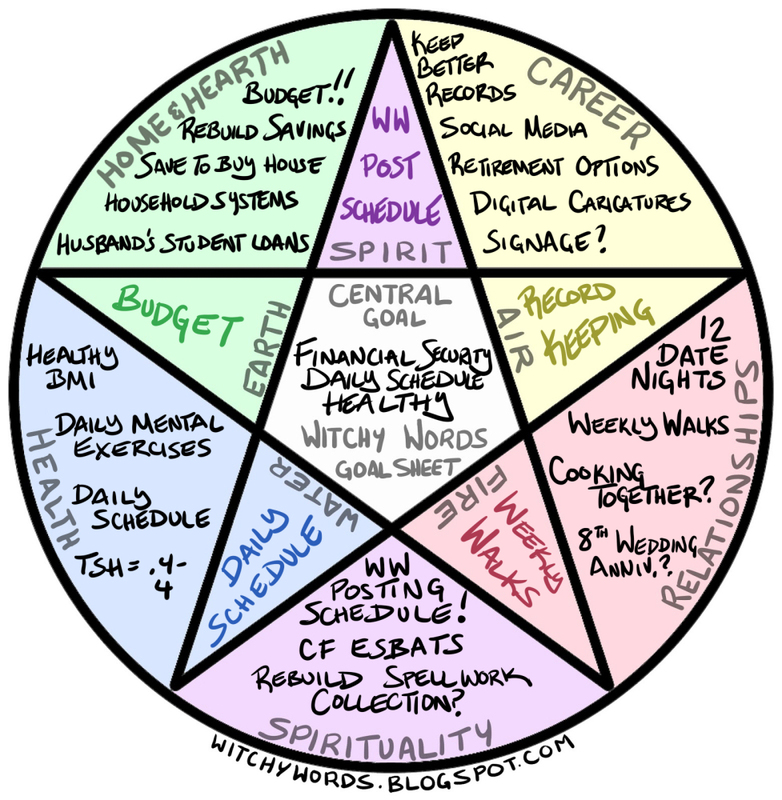 Witchy Words: My Big Three and my Tracking System! Let's start by taking a look at my blank chart. In comparison to last year's chart, I have nine less goal spaces this year! Not too shabby for everything that happened in 2015. It means that my overall satisfaction in life improved 15%! I'm almost in acceptable range. Finally! As you can see, each block has its own specialized goal. It is important to note that I split up my huge weight loss goal into four more achievable 15 pound loss goals for my health section. That way, if I don't lose all 45 pounds but I still experience weight loss, I don't feel like a failure. That's incredibly important when you're planning your goals: Not setting yourself up to fail. While this looks great on paper, that is 22 separate goals up there. Twenty-two. That's a lot of work for one year! If I have a massive health flare or a family emergency, such as, you know, moving twice in 2015 (gosh, I'm a broken record), there's a good chance I won't be able to accomplish everything I've set out to do. As I said just a second ago, I certainly don't want to set myself up for failure. If I can't accomplish all 22 of my goals, I don't want to feel like I wasted my time. Last year, I didn't hit any of my big three goals. I think my biggest problem was that all three were, in many ways, connected. They were from the worst sections in my life but, often times, my career, my health and my finances are one big ball. If one falters, all do. When we had to move, I was unable to keep on top of my work record goals and we had to utilize savings, and the time for the two moves, as well as unpacking and holidays, resulted in me only losing a fraction of my goal pounds. Moving does have a habit of affecting your whole life, but it actually improved some parts. Those three sections are the only three I feel like moving really did any damage to, so I also feel like they have to be pretty connected. In 2015, we stabilized. Even when we had two major, unexpected moves, sudden car troubles and had to say goodbye to our roommate, we never had to ask someone for financial help. If we can survive all that, imagine what we can do without moving! Last year's craze actually resulted in my having a more optimistic view of our financial future. I'm excited! So to fulfill "financial security," I'd like to tick off any two boxes on my chart that may relate to that. Maintain budget and keep better work records? Yes. Rebuild our medical savings and recover from moving? Yep. Pay off half of my husband's loan and research retirement options? You know it. And yes, some of those goals aren't directly in the financial section, but they still relate to financial stability. That's what matters. My life as a caricature artist can be sporadic. Sometimes I'm working a midnight to 4 am after prom, then rolling out of bed at 4 am on a Monday to drive three hours to a daytime college or corporate event I'm drawing at. As I write this, I slept until 3 pm today, worked an evening gig and am now up at 3 am writing this entry. This has to stop. Having a fixed schedule is hard when your work is all over the place, but it's something I need in my life. Most gigs fall relatively between normal waking hours. If I could get on some semblance of a daily schedule and/or weekly schedule, it'd be miles from where I'm at now. It doesn't mean my life has to perfectly mirror the schedule I set in my personal goals. However, if I could get a standard waking and sleeping time, and a general weekly schedule down, I'd be happy. While I improved from last year, my health is still the lowest on the chart. The end of 2015 punctuated that with the massive GI flare. I'm so tired of being sick. I know that the definition of chronic is, essentially, never-ending. There is no remission and no cure. But if I could just feel better when I do feel good, I'm on my way. I'd like to limit this to checking off any one of my goals in the health area but, the truth is, I really need to focus on my health. To accomplish this, I'd like to check off any two boxes related to physical or mental health. Aside from the health boxes, this could include daily mental exercises, recovering from moving or adhering to my ideal daily schedule. In 2017, I would love for my health section not to be the lowest section on the chart. Digitalize party caricaturing. – 0% complete. Expand to reach more agencies, venues and a wider audience on social media. – 0% complete. Procure signage. – 0% complete. Target areas for improvement. – 0% complete. Rebuild medical savings. – 0% complete. Pay off 1/2 of the Chase Loan. – 0% complete. Create an exercise schedule. - 0% complete. Maintain medication. - 0% complete. Learn and perfect one new recipe per month. - 0% complete. Lose .86 pounds a week. – 0% complete. Recover from moving. – 0% complete. Weekly walks. – 0% complete. Last year, I posted the completed list from the prior month and the new list for the current month as separate posts on every 1st. This year, what I think I may do is keep this tracking silently at the bottom of my personal updates. I post those once a month, typically at the beginning of the month too. After giving you my update with pictures and a description of things that happened, I can tack this chart for the previous month at the end of it. That way, I'm not posting about my private goals and life at an overwhelming rate. Heck, I'm sure you're probably tired of hearing about goals since we're on something like day 13 in a row now. So I think that's the best solution there. 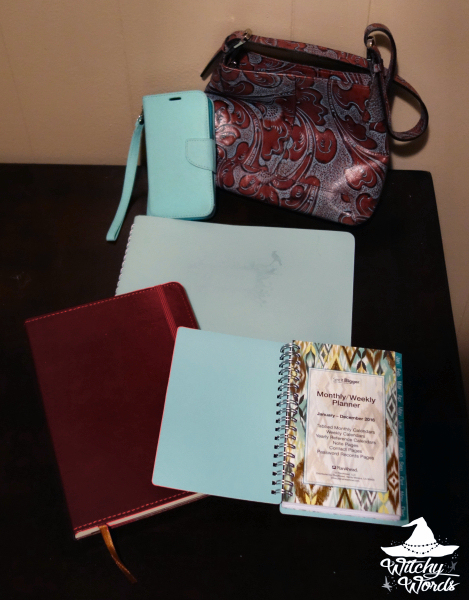 A large planner for at home, a small planer for on the go, my digital planner on my phone and a journal for bullet journaling as I need it. My office marker board calendar. When I schedule my life, I don't mess around! Having the kind of brain I do, setting up multiple places for scheduling and goal work makes far more sense than having just one. The repetition and varied usage helps me remember things much more clearly. This system works the best for me, but of course, that's just me! You may find this system is overkill. Whatever you do to track your goals, make sure it works for you! And that sums up my 2016 goal posts! Thank you for your patience as we deviated from the usual Witchy Words articles for the past almost two weeks. I truly appreciate it. And to those coming along for the ride, good luck! Wow! Impressive. You are very organized. I haven't given my 2016 goals this much thought but now I will. Thanks! Thank you so much! Good luck on your goals! Thanks so much for the inspiration to get focussed. Have a most wonderful day.